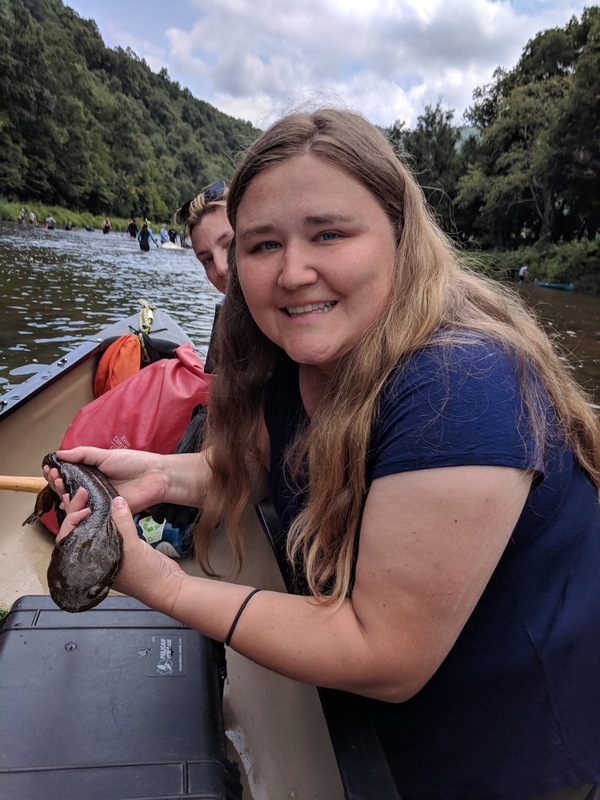 This past week, I spent the whole week volunteering with North Carolina State Parks searching for hellbenders in the New River in Ashe County. Each year they host hellbender week, which is a week dedicated to looking for these fantastic critters in the mountains of North Carolina. They also go by the name of “snot otter” due to their sticky, slimy skin. Each morning at 9:00am, we met at the New River State Park US 221 Access. Ed Corey, Inventory Biologist with State Parks, led the effort and started with introductions. There were a variety of people there each day, some of which were there for the whole week and some for just a day or two. We headed out from there in a caravan to the section of the river we’d be searching that day. Each day we went to a different stretch of the South Fork of the New River. The first day, we had to walk downstream a ways to then come back up searching upstream as we went. The current was pretty strong in places, and the water got fairly deep in spots, so it wasn’t always easy going. Hellbenders are large salamanders, some reaching more than 2 feet in length. They are found predominantly under large rocks, so surveying for them meant lifting these heavy rocks in the river and diving underneath them and looking and feeling around hoping to get your hands on one of these ancient creatures. Several people would use peaveys or cant hooks to lift the heavy rocks, then other people would dive under, and when they were back up they would shout “clear!” to let the people holding the rocks know they were out. It wasn’t too long before the group found the first hellbender. 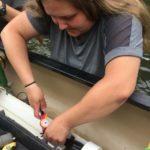 The excitement was contagious as the lucky person who got their hands on it yelled out “hellbender!” My summer intern Lizzy Nist and I helped with transport and processing most of the week. Which meant we didn’t get to catch any hellbenders, but we got to see almost all of them and hold many of them. We helped measure their total length, snout to vent length, and tail width and tail height. We also wrote down whether they were male or female, and whether they had any abnormalities, parasites, or injuries. Some had webbed feet, and some had missing toes or head scarring from injuries. None of them had any parasites. You had to keep the animal cool while in the boat during processing, and that meant using rags to extract and add new cool water to the apparatus they were in. 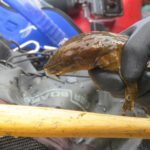 Many pictures were taken by various participants holding the hellbenders after they were processed, but only a couple of pictures per animal as they had to be quickly taken back to the rock they were found under. This was marked by a buoy as soon as they were caught, and the GPS location was also recorded. We did spend some time using the seine net, which was set up behind the people lifting rocks and searching under them in case the hellbender got away, he would hopefully be caught in the net. 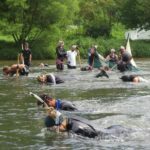 Other people spent their time “cobbling,” or lifting small rocks and holding dip nets in hopes of catching hellbender larvae. We only caught one larva the entire week. Altogether the group found 44 hellbenders over the course of the week. The first day we found 11, the second day we found 5, the third day we found 2, the fourth day we found 17, and the last day we found 9. We were able to tag all but 2 of them, one of which was too small and one was a larvae. Then one was a recapture, so it already had a tag in it. We found a few mudpuppies too. We took off early one day, as my mother and grandmother had come up for a couple of days, and we rode to near the top of Mount Jefferson in the Mount Jefferson State Natural Area. There were beautiful views from three different stops along the road, and you could see all the way into Virginia and Tennessee. We also drove up to the Grayson Highlands in Virginia, which was only 45 minutes away, and were fortunate enough to see two wild ponies, a mare and her foal, at the trail entrance in Massie Gap. Overall it was a great experience getting to spend a whole week searching for these enigmatic salamanders. I had never seen one before this trip, so it was particularly special to be able to see my first and then to see so many in one trip. I don’t know if I’ll go for a whole week again, but I definitely enjoyed my time searching for these interesting creatures. I appreciate being able to contribute to the knowledge about this species, and hope they will be around for many generations to come for other people to experience them.